I was able to get all of his medals back for him, as a Christmas present, Christmas of 2003, with the help of Col. Henry Payne, at the Pentagon, and Senator Debbie Stabenow of Michigan. I made him a display case, with his army picture in the center and all of his medals around, with an American flag fabric backdrop. It was a very tearful event. Wednesday, April 13th, was 60 years from the date of his liberation! Message dated 20 April 2005, from Grand daughter, Kerri Moore. We at World War II Stories -- Their Own Words, were contacted by a granddaughter of Mr. Warren Varney, who served in the 1st Armored Division. My grandpa and hero, Warren G. Varney (better known by his grandchildren as "Paw Paw"), was born May 4, 1921, and raised in Meador, WV. He was one of 9 siblings, 3 girls and 6 boys, one of which died at a very young age. He left school in the 8th grade to get a job and help support his family, although he reports that it was because the teacher tried to tell him that "tater started with a 'p'." He attained a job at the Red Jacket coal mine, and worked there until he was old enough to join the Army. He and his brother Carl joined the Army, and his other three brothers joined branches of the military as well. My grandpa was initially a member of the horse cavalry at Fort Knox, and was only enlisted a short period of time when tanks and scout cars were introduced into the Army's way of life. It was at that time that the "First Armored Division" was created, on July 15, 1940, under the command of Major General Bruce R. Magruder. My grandpa appears in a documentary shot at Fort Knox, titled "Here Comes the Tanks" introducing America to the new way of fighting. It wasn't long before Pearl Harbor was bombed, and he was sent to England via the Queen Mary. My grandpa took part in the Battle of Kasserine Pass in North Africa. He was captured by German forces under the famous "Desert Fox" Erwin Romel, after his reconnaissance unit was separated from communication and wandered through the desert for days. His unit was shown where to find water by the North African desert natives, and while they were drinking at a small, dirty pond of water, the natives brought the Germans to where they were. My grandpa's brother Carl actually witnessed him being taken prisoner. He had four brothers that were missing in action at the same time as he was; however, he was the only one that was actually captured (one brother was blown off of a ship during an attack and survived). My grandpa's mother was given a pin with 5 stars, one for each son that was MIA. He lived as a POW for 27 months, or as he puts it, "a personal guest of Hitler" in prisons and work camps in Germany, working on building a power plant brick-by-brick, carrying bricks on his back up a ladder to build a smoke stack (he saw all of his hard work blown up by an allied plane as they began their march away from the prison near the end of the war). He used to get out of work by using something sweet to attract bees, then picking up a bee and holding it to his hand until his hand was stung and swelled up. He would show the condition of his hand to the guards and they would send him to the infirmary, where he got a "decent" meal, like a real sandwich. Once when he escaped, he returned to feed the other men in the camp with potatoes that he discovered while running away. He and a few other men had dragged them back to the prison in their GI "long-handled" underwear in which they had tied the legs together to make a sack. The German guards saw the tracks made by the heavy sacks of potatoes, and searched the barracks, but they found nothing. The men had squirreled away their stashes, what had not been eaten. The other time he escaped he was on the run for 3 weeks with a few other guys and had almost traveled the entire way to France where the allies were at the time, when they were spotted by Germans from a tall observation tower. He reports that they had guns pointed at them and were preparing ("as much as one can prepare") to be shot, when an English speaking German soldier demanded that they send them back to their prisons, mentioning something about the Red Cross keeping count. After that, he spent a long time in solitary confinement underground, guarded by a German shepherd. He was liberated from a death march on Friday, April 13, 1945, after the Germans ran away, leaving the prisoners to fend for themselves. He joined some British POW's that had been POW's since 1939, and they took shelter in the hayloft of a barn, waking to find it surrounded by allied troops. He lost almost 100 pounds from his 6'1" frame during the entire 27 month ordeal. 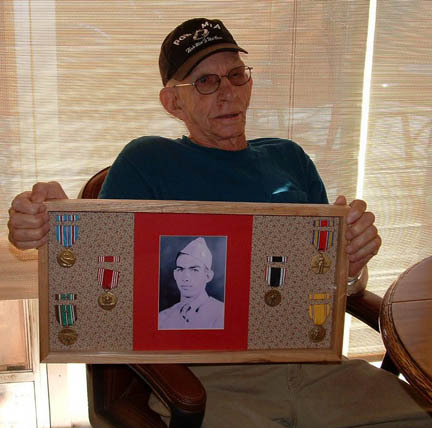 After his return to the U.S., his home caught on fire, and he lost all of his medals, awards, "German souvenirs" and documentation, as well as the pin that my great-grandmother was given. He has no record of his service except for his discharge papers, and our family has no record of his heroics to pass on to the next generation. He is now 82 years old, living with my mother in central Michigan, and he is in good health. He can recall the first and last names of the men he served with, as well as dates and places that he was held. There are so many details that I know that I have not heard everything myself. A lot he won't share with anyone. He uses his sense of humor to cope, and a lot of what he will share has a funny twist to it, like how they annoyed the guards by sneaking back and forth into the barracks during role count, and how they built a radio in the bottom of an old chair that was kicked around but never discovered, and how they used it to tell the guards updated information about where the Germans were losing battles. It the goal of me, Kerri J. Moore, to write a book about his life before he passes, and to see him get his medals back in a public ceremony. I have very dedicated assistance in my quest. My grandpa is a very special man, and he has been my inspiration, my best friend, and my hero my entire life. Disclaimer: The information contained on this page is copyrighted © by the author, Kerri J. Moore, and may not be used in any way without her express, written consent. Information and photographs with regards to Mr. Warren Varney was generously provided by a Grand daughter, Kerri J. Moore. Original Story submitted on 30 September 2003.